Former spy, fugitive and convicted traitor, Christopher Boyce sold U.S. secrets to the former Soviet Union and dodged U.S. authorities for almost two years until his arrest in 1977 at the age of just 22. 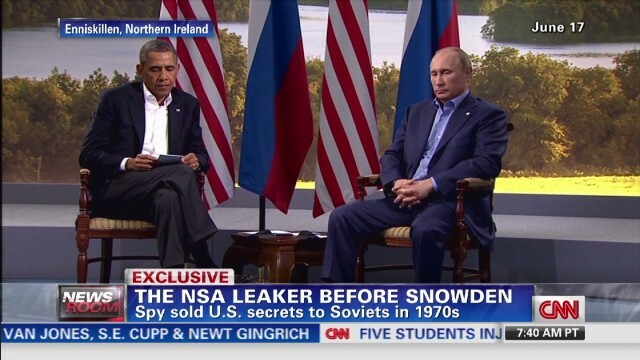 As President Obama and President Putin meet at the G-20 and in the wake of NSA leaker Edward Snowden, Boyce sits down for an exclusive interview with CNN’s Victor Blackwell. Boyce tells CNN that he was ‘glad’ that Snowden released information about the NSA surveillance program. He added, “I certainly burnt my fingers doing it, but I was certainly moved to do it by what I watched on the twixes, the encrypted twixes about our intervention in Australian domestic politics. But I think you’re right, I was looking at windmills, and in the process, destroyed 25 years of my life.